Root's McTeacher Night will be dateTBA from 5-8:00 at Cameron Village. McDonalds will donate a percentage of their profits from thier entire night's sales! IT'S TIME...the annual Applebees Flapjack fundraiser is set for Saturday, TBA. Print ticket order form here, complete and turn in with payment to your child's teacher by TBA. You do not want to miss this popular event. Want to save money on your ticket and have fun? Sign up to volunteer for a one hour shift now - Hurry, these fun slots fill fast! 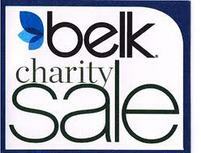 Use your ticket on Saturday, November 9th, 2013 from 6am until 10am and Belk will give you $5 off your first regular, sale or clearance purchase, including cosmetics and fragrances. Excludes Brighton brand, only. Not valid on phone orders or on belk.com. No cash back.